A depressed economy, high unemployment and no potential work opportunities prompted performers Amy Heidemann and Nick Noonan to take to YouTube with a slew of popular cover versions in the hope of finding an audience. Little did they know that one particular cover would be all that it would take to lead them to a record deal and international acclaim with their refreshing pop duo Karmin. We popped on the phone to Amy for a natter and quickly discover she’s still pinching herself. “Yes, we are on cloud fifteen – it’s not even cloud nine anymore,” she giggles infectiously. The story of Karmin really began during respective college years in Massachusetts, when Amy and Nicks’ worlds collided at a party. Though there was instant chemistry between the pair, their beginnings may have been a little rocky. But persistence paid off… in more ways than one. Spurred into action through a lack of work due to the dire American financial situation, the duo took to YouTube with sprightly cover versions of popular chart hits in an attempt to find their audience. It worked, but it would be one track in particular that would catch the world’s attention. “We were eating spaghetti every day and just trying to figure out how to make our musical dreams come true,” Amy recalls. “So we started making the YouTube videos, just hoping that the world would see us ‘cause we thought we had something special, but we didn’t know how to put it out there. “We uploaded to YouTube because there’s something like a billion people on there just waiting to watch cool videos, so we thought that was the perfect place to do it. And it was. The days of sending your demo tapes to record labels are gone. Karmin had uploaded more than 30 videos to their YouTube channel prior to their cover of Chris Brown’s ‘Look At Me Now’. But what was it about this video in particular that made people sit up and take note? “When I started rapping, I think everybody was surprised,” Amy says. “We’d started doing the rap stuff earlier, but it was very gentle. It was that ‘Nicki Minaj’ style rap. But when we did the rap of the Busta Rhymes verse, which is so fast, I think people were really impressed that I could hold my breath for that long. “The record label” Amy speaks of was the global giant Epic. It was just one of a number of major labels that began battling for the band’s signature. One of the factors that makes this fun loving duo so unique is the fact that not only are Amy and Nick partners in the band, they’re also partners in life, falling in love during those college years. Naturally there are challenges that come with being together constantly, but Amy tells us they both wouldn’t have it any other way. 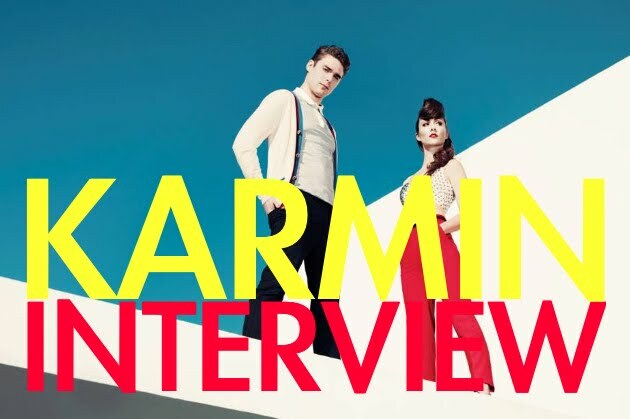 “We had our relationship four years before we started Karmin, so we had the foundations and everything. It’s very unique. I don’t think there are many couples out there doing what we do,” she says. “We had a wedding scheduled for last year, but we had to postpone because a bunch of crazy stuff was obviously going on, but we’re still very happy and very much still together. People think we’re crazy for being a couple and doing this music thing together. They’re right, we are crazy. But their relationship has flourished from slightly tempestuous beginnings. Thankfully, the duo was able to write about the early experience and turn it into a smash hit single – their breakout Australian hit ‘Brokenhearted’. “‘Brokenhearted’ is about the night that Nick and I met each other,” Amy admits. “We met at a party in college and like I said, we were so opposite, but we totally hit it off. We got along so well – we had the same sense of humour, but we come from very different backgrounds, so it was an interesting collision of our two worlds. It was almost like ‘Romeo and Juliet’ in a sense. “He didn’t call me the next day and I was so crushed. I can usually get whatever guy I want. But I was one of only a few girls in the whole school and he didn’t call me or text me. I remember checking my phone every five minutes and I felt that half of the other girls in the world had probably gone through the same thing,” she says. Thankfully, once the communication channels between the two had been opened, Amy discovered that there was a simple reason why she hadn’t heard from Nick. ‘Brokenhearted’ is lifted from the band’s debut major label EP coincidentally entitled ‘Hello’. Amy describes it as the perfect way for the band to introduce themselves to a growing global audience. “We just thought this was the best collection of songs to say ‘Hello’ to the world,” she says. “We recorded close to 50 songs, a lot of which we’re saving for future releases, but we thought it was the best collection of songs to tell our story – at least at the beginning. And as the single ‘Brokenhearted’ continues to find favour at Australian radio and subsequently climb the local charts, we have a sneaking suspicion that we’ll be hearing plenty more from both members of this fresh-faced duo well into the future. 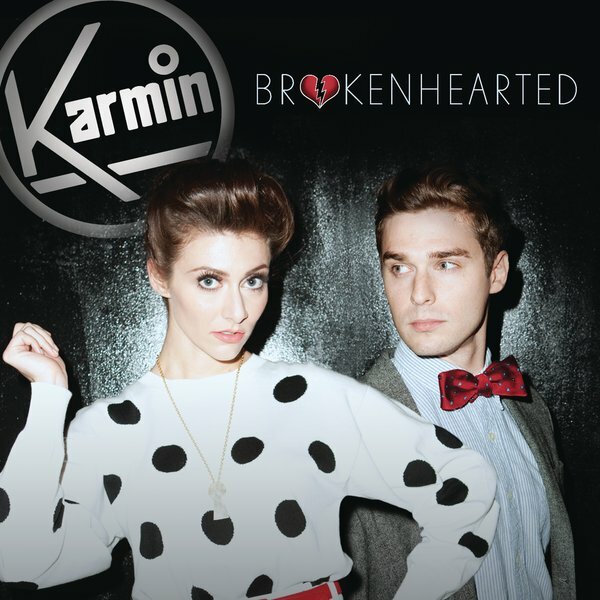 Karmin’s single ‘Brokenhearted’ and their ‘Hello!’ EP are both available digitally now.